Yeah, I've been having a look around at what bikes use shocks up to about 50mm longer. I dropped it off the stand last night and it would definitely benefit from it. It would help me too, being 6'3". The XR500 engine does indeed drop straight in - if you can find one! Certainly in the UK they're pretty rare now, and thus sell for ridiculous amounts of money. There's a local guy that offered me two engines for £300, but they were in tons of pieces scattered around his workshop and the only way I'd know I'd got everything would be to take an exploded diagram with me and piece it up at his shop. Seemed a long process for 5mph, though the extra torque would be lovely. The plan is to keep it as a 250 for now but if a 500 motor comes up for sale I'll jump on it. I think it could work well for what I'm after if I can't make the stock one work. That looks good. 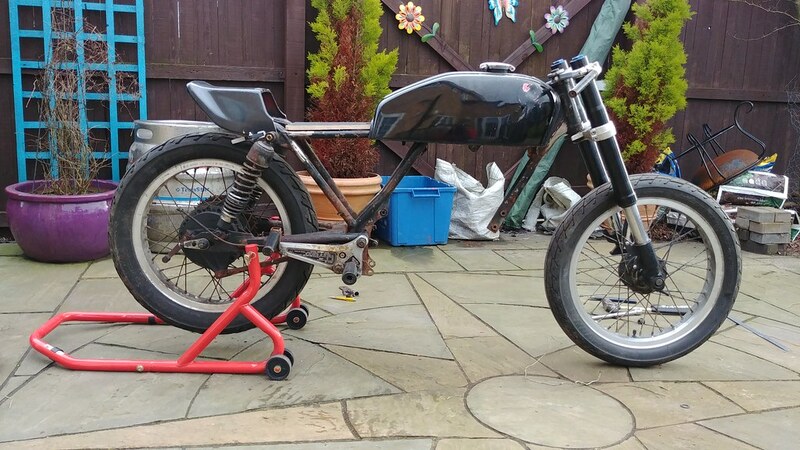 It's an adaptation of a TZ250C/D/E seat. Yeah, I'm thinking a slightly lower, further forward version of it. Colour scheme. This is gonna be Chevrolet Black Rose or similar. It's gonna have a dark silver stripe down the centre, where the ridged section of the tank is. Wheels. Stainless spokes, Polished rims, Powdercoated hubs. Continental Classic Attacks. 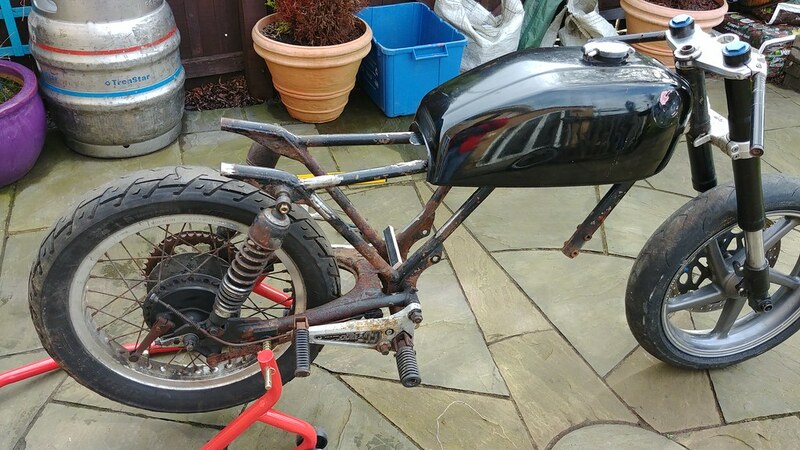 Start stripping the front wheel down tomorrow hopefully. Stripped the front wheel down today. 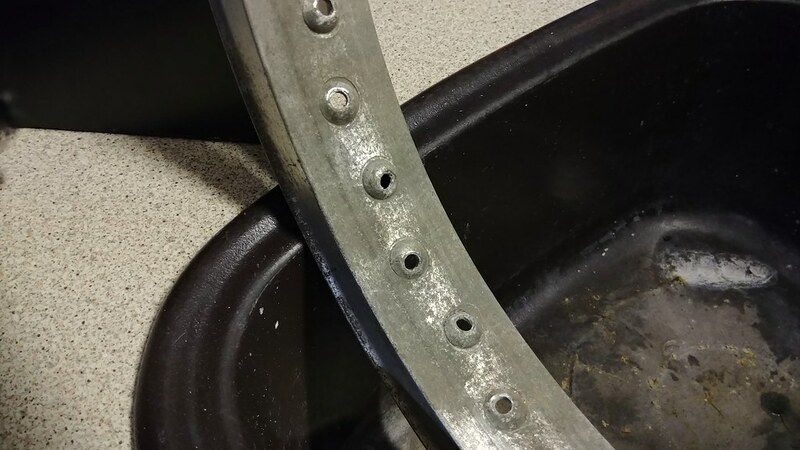 Managed to save some spokes for measuring but had to cut most of them out. Time to start seeing if these rims will polish up or if they're too far gone. Well, I think I might have just won the bargain of the century award. So a couple of nights ago a local guy found my aprilia forks on ebay and came to collect them. Obviously got chatting about bikes and he races small capacity bikes. He was interested in quite a few bits of mine so I gave him my number and he said he'd give me a shout if he wanted anything. Fast forward to today and I got a text off him saying he had some spoked alloy wheels I might be interested in. 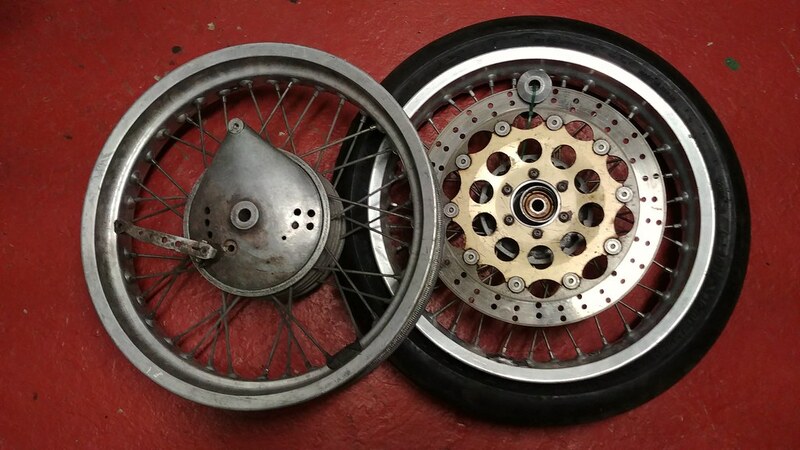 17x3" rear and a 17x2.15 front, and already had a brake spacer fitted to the front to suit an RS125 disc brake! Great, I thought, since a 17" would give me much better tyre choice, and with a bit of luck they'd need less work than mine too. I popped round to see them tonight since he's literally 5 minutes away. 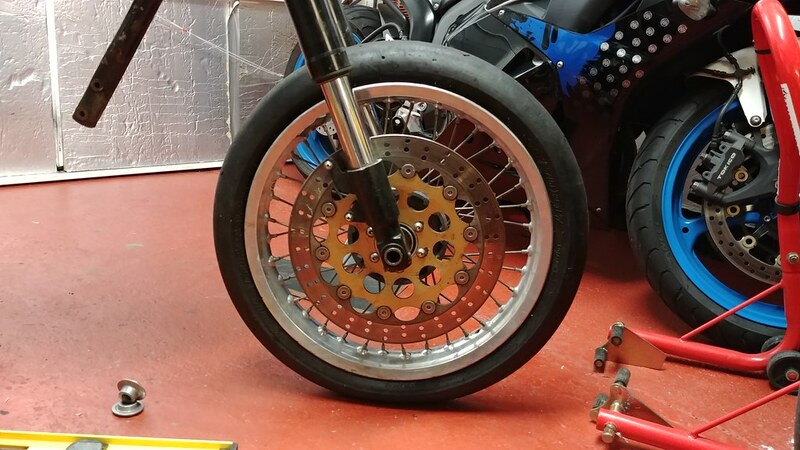 Well they were just fantastic, they need a clean but very little in the way of corrosion, spokes all look good and the rear came with the drum brake assembly too. They're both Akront rims so good quality stuff. But the best bit was the price. I offered some of my parts that he was interested in but unfortunately his mrs would have killed him apparently! So instead he asked me for £50. Fifty! I nearly choked! I felt like I was robbing him as I drove away. Today we spent a bit of time making the front wheel fit the RS forks. However, luckily there was an off the shelf bearing that fit what we need to suit the MZ hub diameter with the Aprilia spindle in it. I popped by our local bearing factor and they had them in. 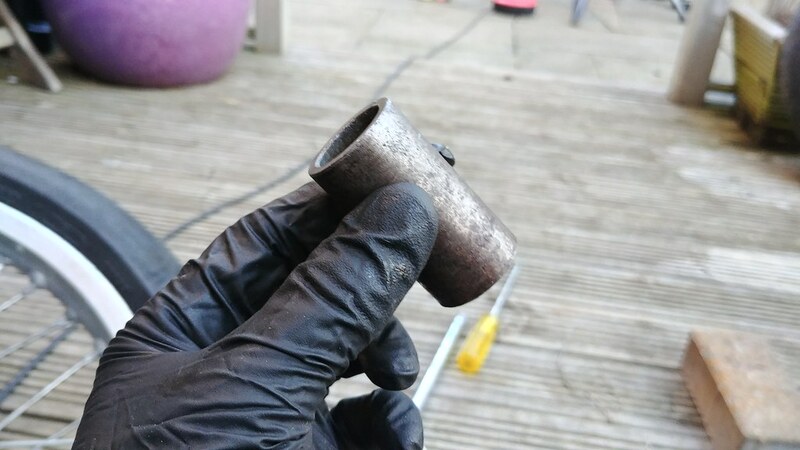 Unfortunately, the bearing spacer would also need replacement to suit the aprilia spindle. 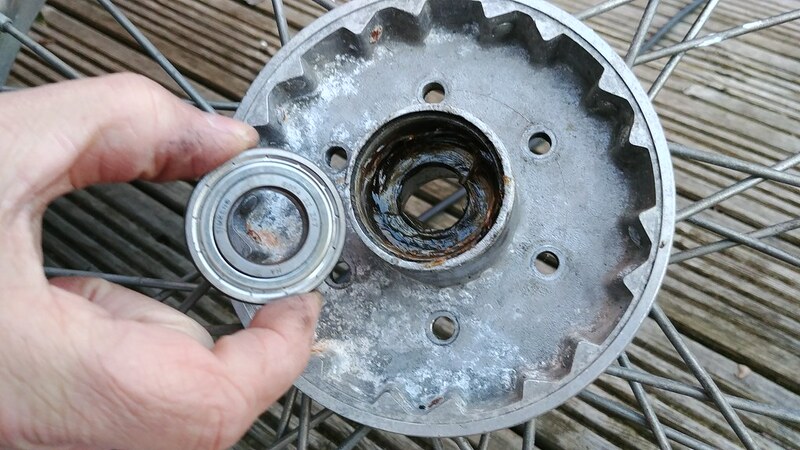 One bearing has a nice shoulder to sit against inside the hub (and due to the larger bearing ID this also now caught the inner race to prevent compression too). We grabbed an Aprilia spacer from a spare wheel and measured it up. It would fit what we needed, but wouldn't fit through the shoulder on the inside of the hub, so it was a handy bonus that the inner race on one side was nicely supported already. We could then sit our new spacer against the other side of the shoulder to support the new bearing at the opposite end of the hub. Christ I over complicated that description. Anyway. 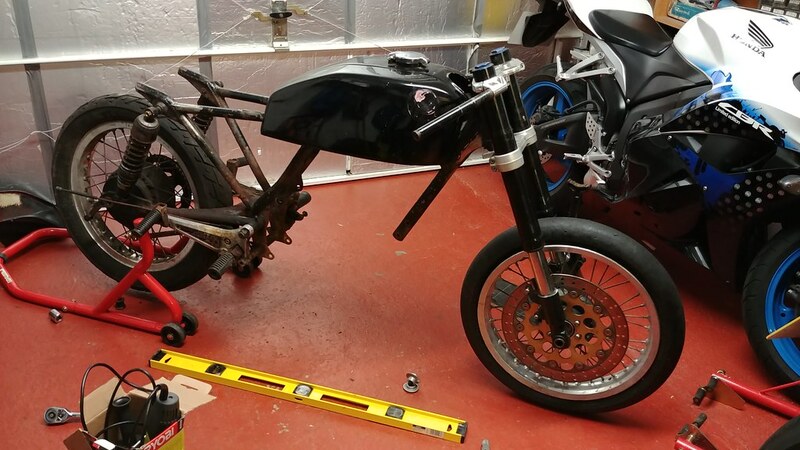 We measured the required depth and lopped the Aprilia spacer down to size and chamfered the edge slightly with the grinder. All that was left was to mount the Aprilia disc adapter and disc to the hub and mount it up to the forks! Definitely gonna need a better sized tyre than that little thing but it's looking good so far and I should have a good choice of rubber for them.